In his recollections, Lipchitz describes this bust produced in 1920 as a token of friendship between one artist and another. It depicts probably the first known portrait of Raymond Radiguet. Jean Cocteau is said to have brought the young poet to Lipchitz to have him do his portrait. Radiguet, then aged 17, had just co-founded Coq magazine with a friend and was working on The Devil in the Flesh, which he read while sitting for his portrait. 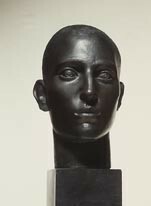 In his series of portraits from 1920-1922 – whose subjects included Raymond Radiguet, Jean Cocteau, Gertrude Stein and his own wife Lulla – Lipchitz distanced himself from his quest to deconstruct motifs on multiple interlocked planes in the wake of the constructivist and cubist avant-garde, turning his back on deformation to revive the classical aesthetic of the portrait. All features become figures of style in a quest to sketch the lines of the face, uncluttered. This aesthetic indeed recalls Radiguet’s literary aesthetic of the same period, which was described by Cocteau as ‘that surprisingly novel method which consisted of not seeming original’.